In this article, we will discuss “How to make Vue Js Reset Password With Laravel API”. In our previous article on this series, you will learn Laravel JWT Authentication and Vue Js application setup with Vue Auth and Laravel JWT Auth. I will recommend you to read out both of the previous parts for better understanding. 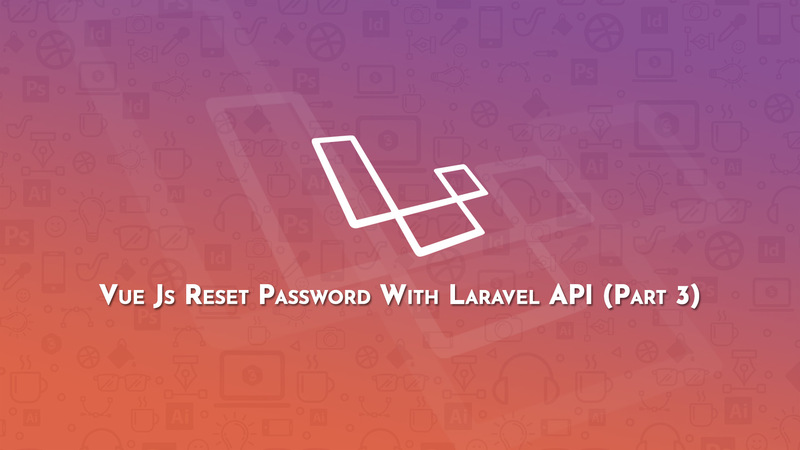 You can skip those if you are looking only for the specific User Reset Password functionality using Laravel API’s. We are using our “AuthController” to handle password reset functionality. Add the following traits to our Authentication Controller. After that, you need to add the following function which handles the notification mail. End user receives a mail on his/her email. Where they click on the reset link, then the user clicks and redirect to our application to reset the password. * Send password reset link. Note that, sendResetLinkEmail method does not return JSON response for our API. Because it’s defined for web base functionality so we need to override the response for our API. The response is manage by sendResetLinkResponse and sendResetLinkFailedResponse function. You can found these functions in the SendsPasswordResetEmails trait. Add the following function in your authentication controller. * Get the response for a failed password reset link. You need to use the following artisan command to create a custom notification. You will found the newly generated notification class at “app/Notifications”. We need to extend the “Illuminate\Auth\Notifications\ResetPassword” and override the “toMail” function. After updating all the code notification class looks like below, you can update your “MailResetPasswordNotification.php” with following code snippet. In this notification class, I’m using the ResetPassword trait. Here, I override the toMail function where we use our Vue Js app URL to handle the reset password form. In this URL we are sending a unique token. A token is mandatory to add in this mail otherwise the notification sending is totally meaningless. To finalize our notification, we need to update our User Model. Please check the below mention code snippet, and add in your User Model. * Override the mail body for reset password notification mail. Now, we need to create routes which handle notification mail and update password. So open the “routes/api.php” and update your routes. As per the route, which handles the reset password process. I’m creating a “callResetPassword” method in the AuthController and make sure this function can be accessed by unauthenticated users. So the user can easily process the reset password request. This function calls the reset method, this method sets the new password, save the user, set a different remember token for the user. But, we are making this functionality for the Vue Js and using JWT authentication in our API so we don’t need to store a remember token. Check the following resetPassword method and add this in your controller. If you face issues to use PasswordReset and Hash in your controller. Then add the following code snippet in your AuthController before the start of your controller class. After that, we need to manage the response. Because as per our API, we need a JSON response. But, the default method response is not in JSON format so we need to override the response method for our API’s. Add the following functions in your AuthController to override the reset password response. * Get the response for a failed password reset. Here I’m creating two routes, first for a reset link request form and second for processing a reset password form. So open your “resources/js/router.js” and add the following routes. As per the first route, I’m creating a component “ForgotPassword.vue” at “resources/js/page” directory. In this component, we create a form where the user fills there registered email id and request the reset link. In the above ForgotPassword.vue component, I’m using the API which sends an email to the users who want to reset the password. The user needs to click on the link which redirects a user to our second route. Where the user has to enter the new password for reset. I’m using mailtrap to test email notifications. It’s easy to add in your Laravel application. You just need to create an account on mailtrap then add your mailtrap credentials in your “.env” file. After this, you will receive all your emails on your mailtrap inbox. You can learn more on Laravel Mailable here. As per the screenshot, when you click on the Reset Password button then user redirect to our application where he/she able to reset there password. As per the second route, I’m creating a component “ResetPasswordForm.vue” at “resources/js/page” directory. In this component, we create a form where the user fills there new password then submit the form. As per our email notification mail, you see URL contains the unique token. And we send this token with our form parameters to the server using API. After that our API handle this request and update the user password.